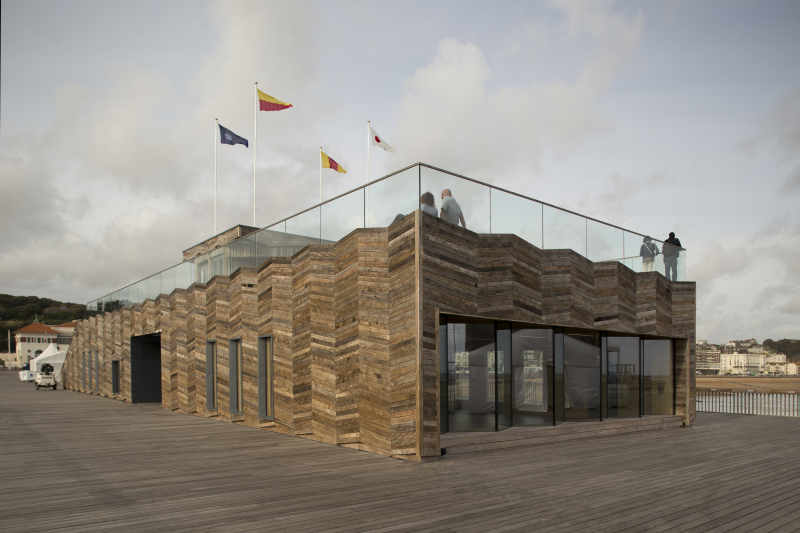 dRMM Architects’ conceptual basis for the re-design of Hastings Pier in East Sussex, England, was not to create an unnecessary hero building, but instead to provide open space to allow universal access. After the pier was destroyed in a fire in 2010, consultations with locals and stakeholders informed dRMM’s approach to create a well-serviced platform for a variety of events and activities. In fact, users can now bring their own architecture to plug in. Small local trading stalls in the form of classic beach huts have already arrived, setting the scene for future possibilities. 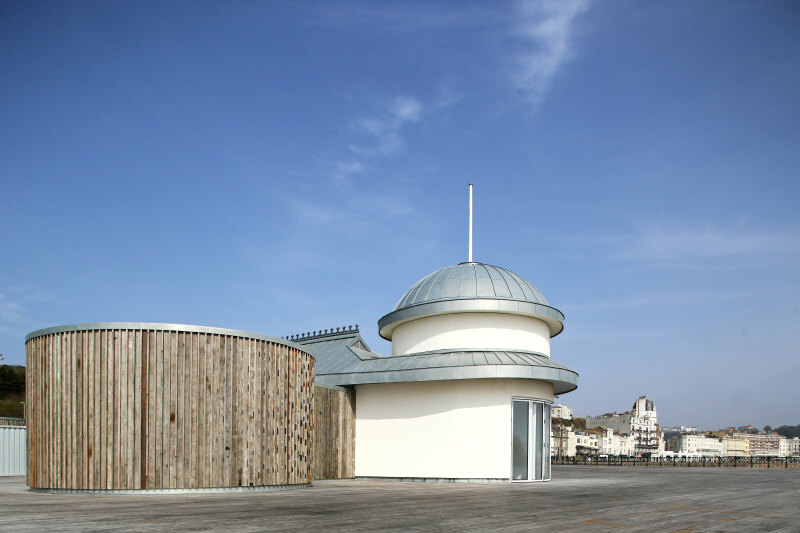 The restoration project entailed repairing the damage to the deck due to the fire, sea erosion and storm damage, as well as converting the single remaining derelict Victorian Pavilion on the pier into an open-plan, fully glazed restaurant and visitor centre. Future phases include a ramp and stairs to sea level and a mobile, timber canopy that traverses the entire length of the 280m pier and straddles the visitor centre to form a covered auditorium for large-scale events, even in the winter season. The new visitor centre is a glass and cross-laminated timber structure, inventively clad in the limited timber decking that survived the 2010 fire. The cross-laminated structural timber panels with glulam beams were deployed to provide structure and the internal wall and soffit finish throughout. Insulation levels are high, as is air tightness. Not only has this enabled speed of delivery and far fewer follow-on trades when compared with other construction methods, but lighter weight and thus smaller foundations, critical in a tidal pier context of working in the sea. 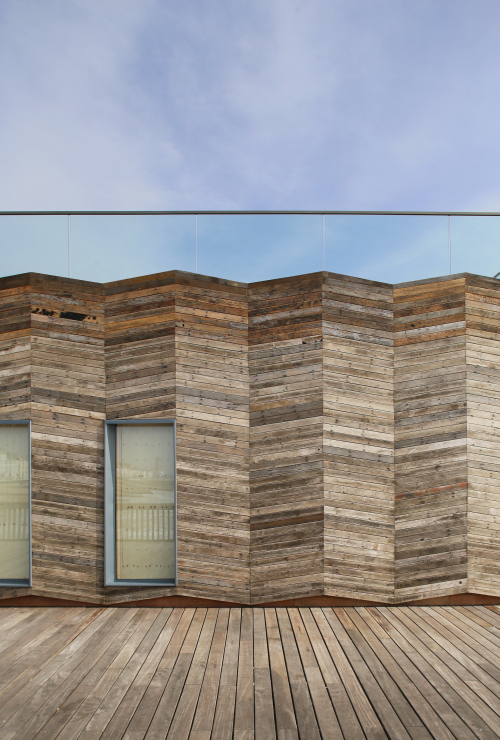 The reclaimed timber was also used for the furniture on the deck of the visitor centre, designed by dRMM and Hastings & Bexhill Wood Recycling Ltd as part of a local employment initiative. This has reduced cost and waste significantly, and provided a durable and memorable material uniquely qualified to deal with the particularities of the marine climate. The centre offers adaptable space for events, exhibitions and education, with an elevated rooftop belvedere. A glass-walled, open-air room looks out to the vast views over the pier and beyond. The constrained budget did not allow for formal BREEAM rating, but these guidelines were adapted. The visitor centre is naturally lit and ventilated, and the unpainted timber structure is the internal finish, avoiding a need for plasterboard or paints and requiring no maintenance to the interior. Full thanks and acknowledgement are given to dRMM for the information given to write this article.